Digging up your lawn isn’t as daunting as it seems. My advice is to start small and let things evolve from there. 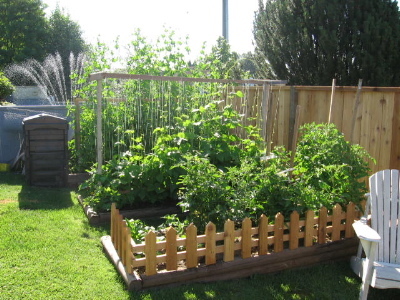 This story explains how we transformed our Pitt Meadows backyard from lawn to food, one small piece at a time. It took every cent we had (and then some ~ thanks Mom) to purchased this 4 bedroom, 25 year old home in December of 2004. Our lives were extremely busy at this time with renovations started, 3 teenagers, their schooling, sports, activities and our full time jobs. Regardless, of the chaos and lack of “time”, I wanted a vegetable garden in the backyard. It would have to be small, so as not to become a burden, just enough to enhance and nourished our lives. Starting with a shovel and no budget, Dave began turning over turf in the spring of 2005. After finding some landscape ties on our property, we repurposed them into 3 raised beds in the south facing backyard. The garden beds were 3 feet wide by 8 feet long. We left 2 feet between the plots, allowing the lawnmower to pass through. Our new neighbours called the row of 3 beds, our “grave yard” garden. I must admit it did look a bit spooky until our vegetables started growing. In the first bed, I planted 4 tomato plants after adding vegetable scrap compost to the soil. I previously had huge success with tomatoes in our Lillooet garden, but neighbourly advice said the West Coast wet weather could cause a “blight”. I took precautions by applying a thick mulch of straw to the base of each plant, hoping to curb the blight fungus from splashing up from the soil. Success! Our tomatoes produced a huge crop that our family of 5 consumed in salads and salsas all through the summer. In October, when frost threatened, I brought the green Tomatoes in the house to ripen on the window sill. The middle bed was seeded with beans, lettuce, radishes, spinach and 2 Broccoli plants. After the initial heads of Broccoli were harvested, the plants continued to produce side shoots well into November. In addition to salad greens, this bed produced a consistent supply of baby carrots that I “thinned” out as the season progressed. In the third bed, along with swiss chard and onions, the most amazing green peas towered throughout July. I built a 5 foot trellis to support the peas, which was screwed into the sides of the raised bed. The trellis was 3 pieces of 2×2 wood that formed a square (Yes, a 3 sided square). I added small tack nails, every 4″ to the top rail and into the landscape tie below. With some cotton string from the dollar store, I laced up and down connecting the nails. The ”Green Arrow’ Peas grew up around the strings, reaching over 7 feet tall and producing mega pods for picking. Time spent tending this vegetable patch was minimal (after I taught our dog not to dig in it) and most importantly, it was very rewarding. 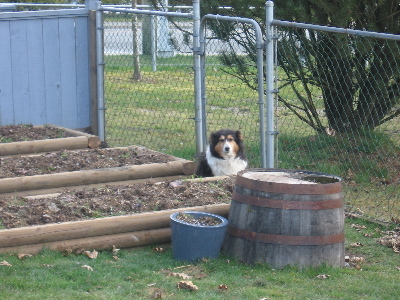 We spent more time mowing the lawn (front & back) then maintaining the vegetable garden. Plus! It was a great way to clear my mind after work … tweeking and plucking out a few weeds, then snipping fresh produce for the dinner salad. 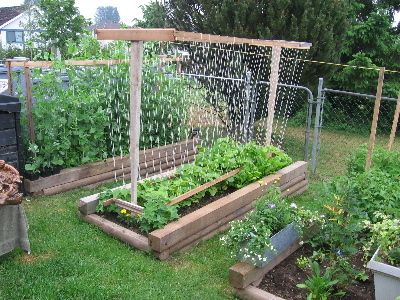 The tomatoes, 7′ tall peas and our new cedar fence made from recyclesd telephone poles. In the background, our neighbour watering a lawn that was never used for anything but mowing. 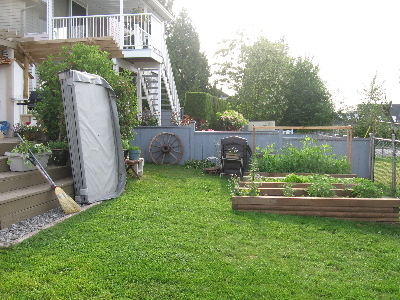 This entry was posted in Pitt Meadows, Yard Transformations and tagged backyard, change, dig, food, fresh, front yard, garden, grow, lawn, organic, produce, soil, vegetable by Lynda. Bookmark the permalink.